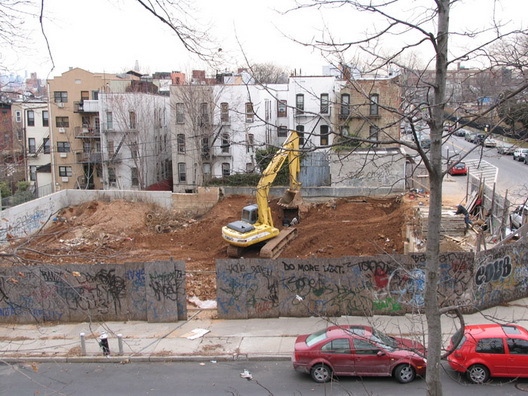 We had some photos of the mess outside the so-called Minerva Building site at 614 Seventh Avenue in Greenwood Heights, but were not going bother with them since the real mess appears to be inside the construction fence. Concerned Citizens of Greenwood Heights sent out an email last night that seem to show some dangerous work being on the site, where work has resumed. If the name Minerva Building rings a bell, that's because this is the site where a Roebert Scarano-designed building that would ultimately have blocked the view from historic Battle Hill in Green-Wood Cemetery was ultimately blocked as part of what Brownstoner calls "Greenwood Heights longest-running soap opera." 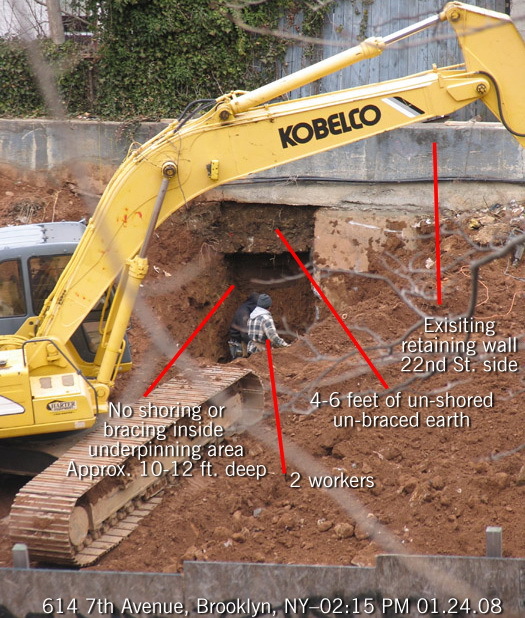 Seems the new way to underpin an existing retaining wall and 6-8 ft. of loose dirt is to dig below it, put up no shoring or bracing and send in "the boys" to do the dirty work...and potentially lose their lives. The attached shots were taken approx.. 2:15pm this afternoon. Just what 23rd/22nd St (heck, Greenwood Hts.) needs...more illegal development! 311 was called immediately, as well as DOB. We were told inspectors were dispatched tout suite (thank you DOB!) and not sure what happened. The site was shut down soon after, but no SWO posted nor nothing on BIS as of yet. We hope DOB's excavation squad caught them in the act (fingers crossed). And of course we hope no one was hurt. Damned if it did not look illegal, if not completely hazardous for the workers, let alone the collapsing of the retaining wall and back yard of 2 properties on 22nd St.
Can this property get any worse than it has in the past FOUR YEARS! I guess we can wait and see. All we will say right now is, interesting excavation technique. Big ol' SWO at 614 7th Ave, with 3 DOB violations, no less. Guess their technique's less than stellar, according to the DOB...and us! Kudos to the DOB excavation unit for nabbing them. I would like to thank the Department of Buildings for their quick response to the Concerned Citizens of Greenwood Heights observation and complaint. I just looked on their BIS System and see that a Stop Work Order was issued and a potential disaster was adverted.